There’s something about the glow of strings lights that can make even the most ordinary space feel magical. Doesn’t it make your heart skip a beat when you see them? 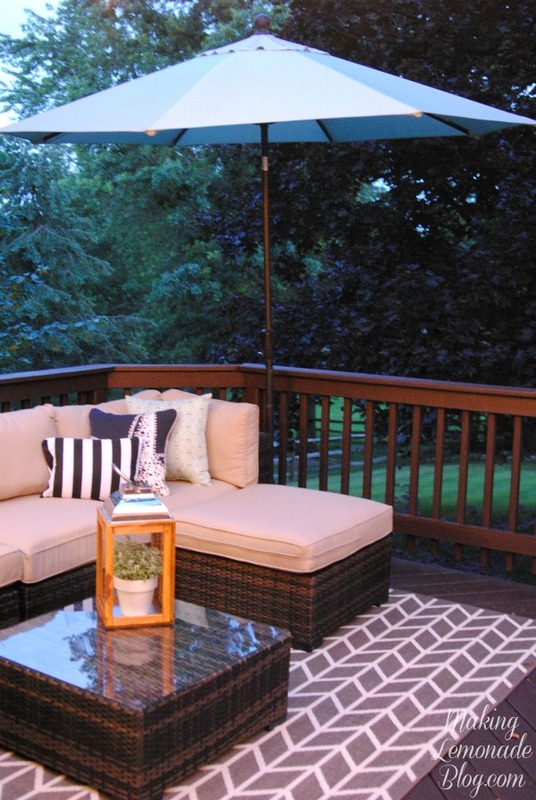 Plus the glow is incredibly flattering, so I can’t be held responsible for what magic may happen when you install these outdoor patio and deck lights at home. What? You don’t have enough walls to hang them outdoors? Pshhhh, no worries! 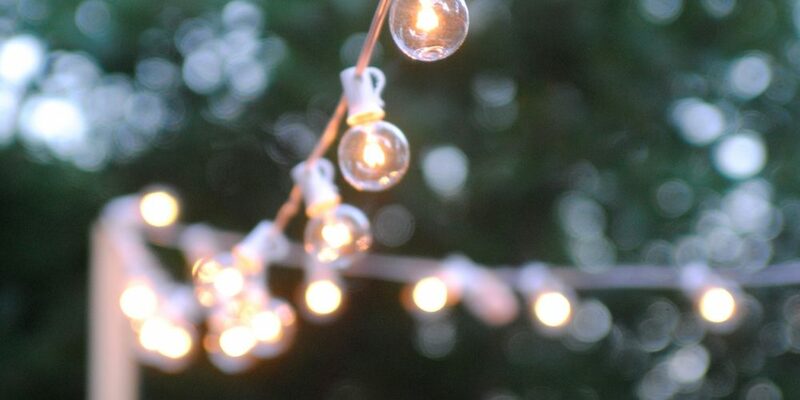 Here’s an EASY (duh, it’s me) and CHEAP (of course) way to hang string lights on your deck, patio, balcony, garden, backyard– really, ANYWHERE you’d like a little extra glow in minutes flat. Does this make me the Queen of Cheap and Easy? So be it. 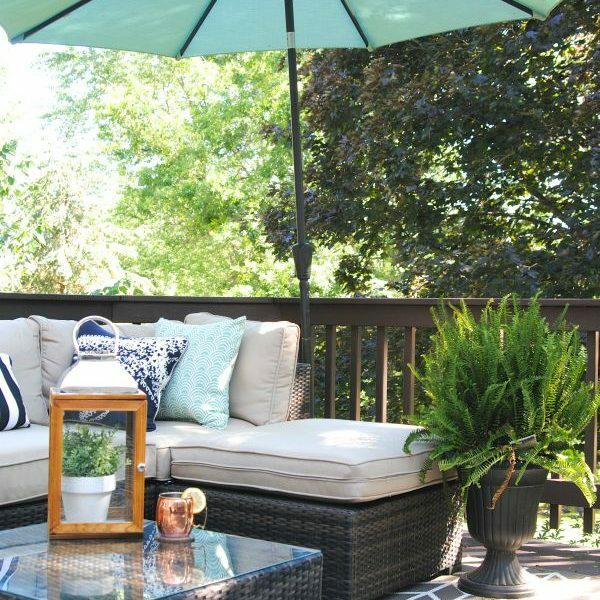 Once you see how easy it is to add this magic to YOUR outdoor space you can call me whatever you’d like and I’ll go with it (great, can’t wait to see who finds this page by googling ‘cheap and easy’). 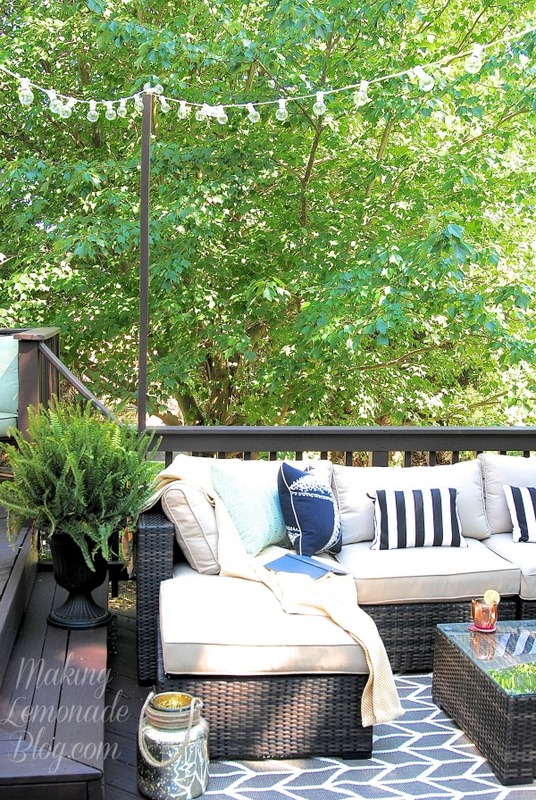 I’m going to show you how to do this when you have a deck, but if you don’t have railings or even walls just stick these poles into a large, sturdy planter filled with large rocks or sink it in a form filled with concrete. Here’s where we started, with a 8 foot long 2X2 from the hardware store. This one cost $4 and was warped, bad choice but we wanted to be sure it would work before ‘investing’ in the $10 pine 2X2s they have that are stick straight. We plan to go back and get the pine 2X2s, but quite frankly the warped one has been through a few summer storms thus far and doesn’t suffered one bit. We only used one pole, but if you really want to light it up or don’t have an opposing wall to hang the lights from then grab a few. 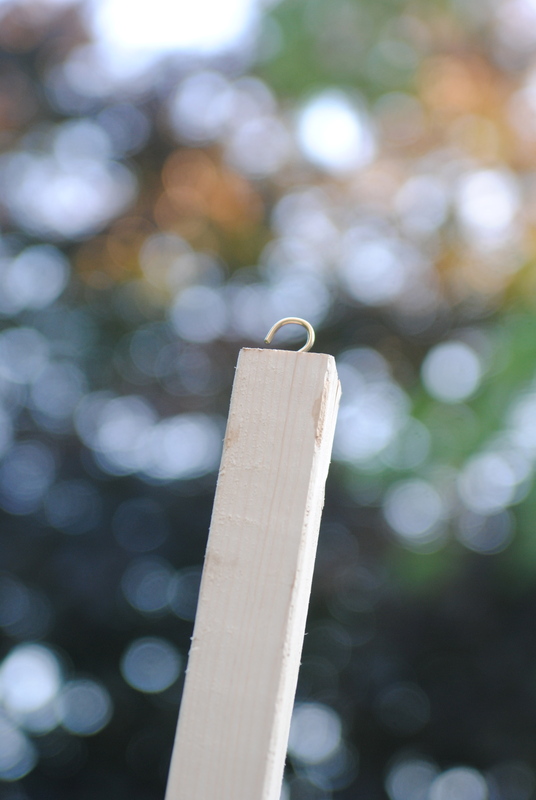 First, screw a cup hook into one end of the 2X2. Then, screw the pole into the railing. Use sturdy screws and you may need to drill a pilot hole first. We did two screws, one at the bottom of the railing and one at the top of the railing. 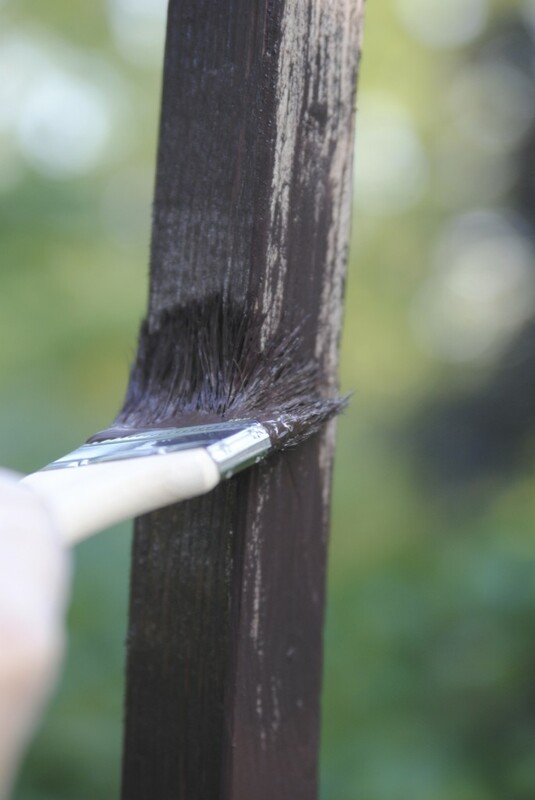 NOTE that you may need to use a shim to support the bottom screw if the edges of the railing are uneven, this will keep your pole straight. Take your lights out of the package CAREFULLY. 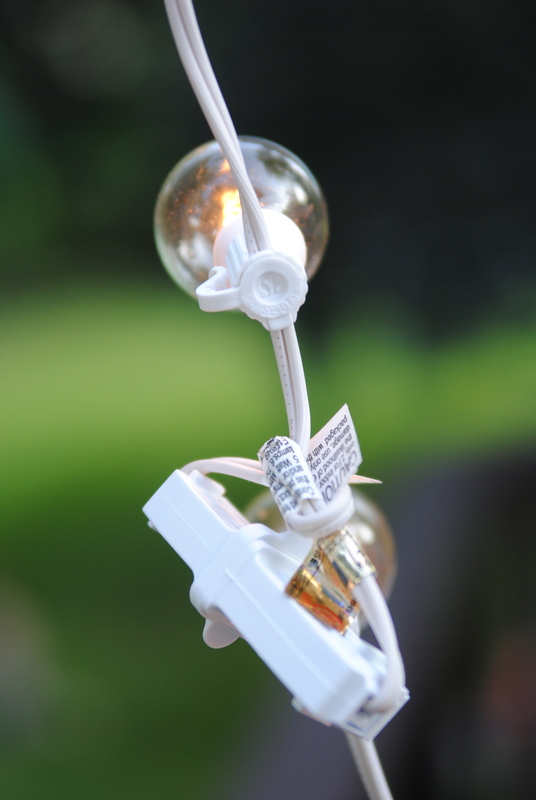 We used these indoor/outdoor globe string lights but they are fragile! They are perfect, though. 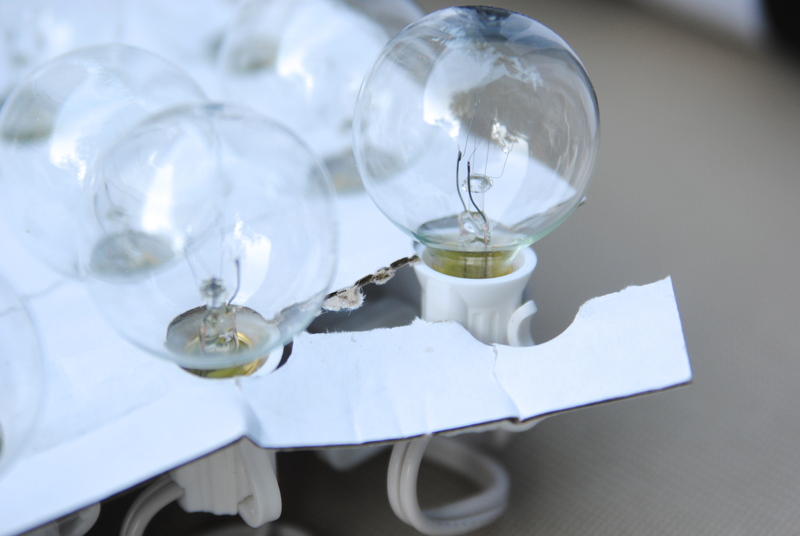 Thankfully the box came with perforations for removing the lights without unscrewing the bulbs. Then, screw a cup hook into the wall where the light will originate. We used an outdoor extension cord from the outdoor plug and up the wall to save the lights for the ‘ceiling’ area. 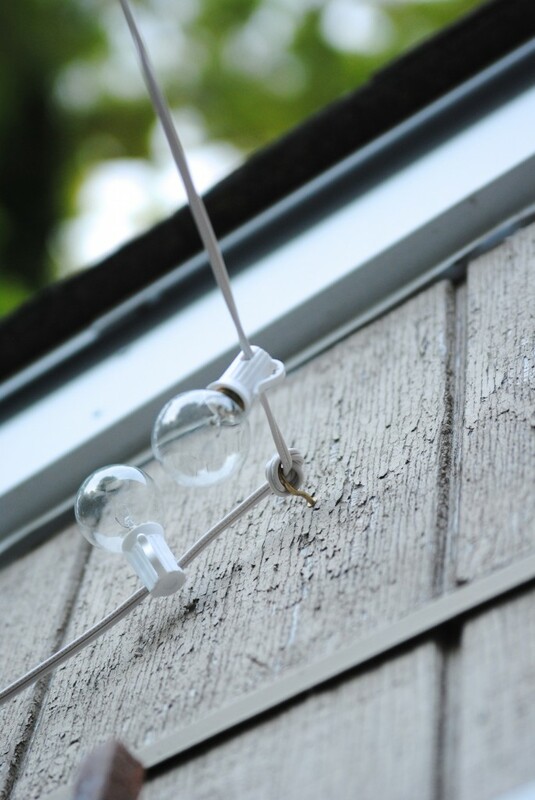 Plug the light set into the extension cord, and string it through the first wall hook and over to the pole. THIS IS A GOOD JOB FOR TWO PEOPLE IN CASE THE LIGHTS DROP. Ask me how I know. Grrrrr. With that in mind, it’s super important to secure the lights at the plugs! We didn’t tie it tight, but we did make sure they were interlocked at each connection point as well as looped it around the cup hooks to keep it from sliding off. Swag it back over to the wall, and kablam, MAGIC. I should note that I painted the pole with the solid deck stain after it was in place. It’s much easier to paint it that way, and now it blends into our deck beautifully. Pinch me. Is this seriously my home? We’re out here every night that it’s not raining. The glow is unreal and we are spending more time outdoors than ever before. Now we just need to have a party. 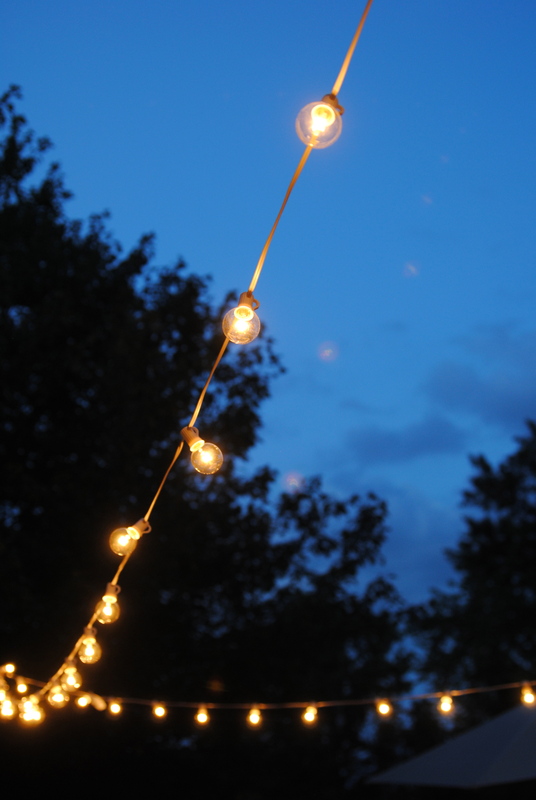 A party under the stars and string lights. Who’s in? Here’s the rest of the Deck Diaries series, including the final reveal! 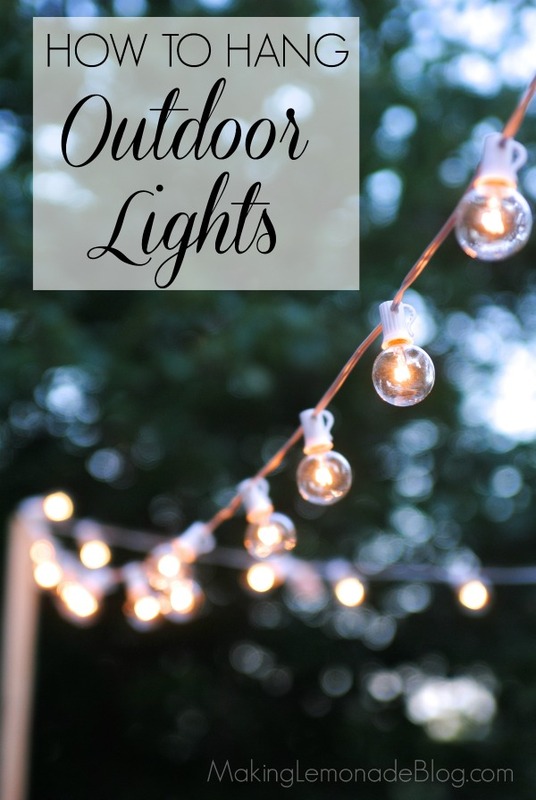 Do you have outdoor lights on your patio, porch or deck? Any upcoming parties to bedazzle? For $35 TOTAL (plus the string light set we smashed, ahem) we feel as if we’re on vacation every night. I can’t believe we waited so long to do such an easy DIY project! next post: Salted Caramel S’Mores Recipe… yes, I went there. Rather than looping the wire around the cup hook, looks rather tight, ( not a good thing to do. The wire strands inside are somewhat fragile and this could cause a short ) buy a package of tie wraps. They come in all sizes. Loop one around the the wire, slip the other one in the first loop, snug it up, SNUG…not too tight…then make a loop with the second tie wrap and hang onto the cup hook. You can easily cut the long tails off so you won’t notice them. Much safer. Looks great ! Guess that’s my next project for the new deck. Thanks! I agree, wrapping isn’t ideal but we were eager to hang them. 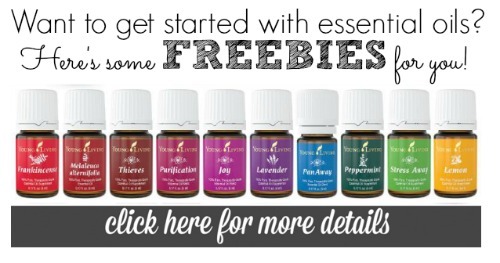 Love your idea, we’ll try it this weekend! I don’t know you but you literally just saved me hours of frustration. I wasn’t too eager to loop mine, either (I live in Chicago and we get enough wet weather and I didn’t need shorts in that environment). I’m trying to wrap mine around my metal balcony and not having any luck, as they’re really more suited to being strung straight, not wrapped. The outdoor duct tape looks unseemly and awful, and isn’t doing the best job of preventing drooping. This will allow me to make this awesome. Thanks so much for your suggestion! Hello! where did you get your rug? love it!! Where is that sectional from so nice! We haven’t had a big problem with bugs drawn to these lights, but in general I diffuse citronella oil on our deck to control bugs and it works well. Nice job! It really does look like vacation every day. It would only be cooler if you did this project with solar lights. That way no demand on your energy bill and they come on automatically at night! How do these hold up in the wind? I just worry about wind blowing it off. They hold up great! We took them down over the winter because I didn’t think they’d handle snow well. If you have a major storm coming maybe take them down but in general we had no issues. String lights are great on decking but I live in a very windy area and they get pretty beat up. So I run super heavy duty fishing line and attach the string lights to that. Hi Carrie, We’re checking out lights for our patio and this looks interesting! I am a little afraid of the bugs though. Where we live is near a chicken farm and there are serious bugs around! Still, this looks an invite I am looking for! Thanks Carrie! My wife and I just hung lights on our patio using tips from this post. They look great! We appreciate what you do here, thanks again! Thank you, that’s such a nice compliment and I’m thrilled you found the tips helpful. 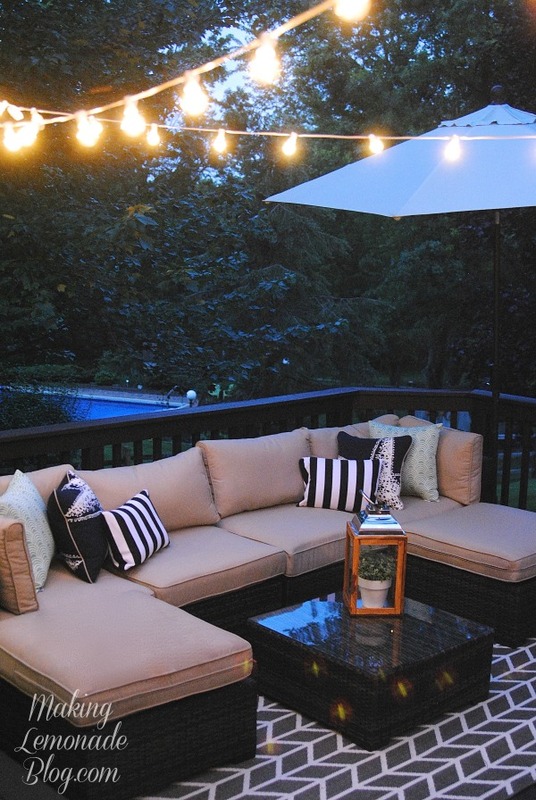 Enjoy your new patio lights! I have a vinyl covered house and I’m reluctant to screw cup hooks or anything else into it. I’m thinking of screwing cup hooks into the aluminum gutters. What do you think? 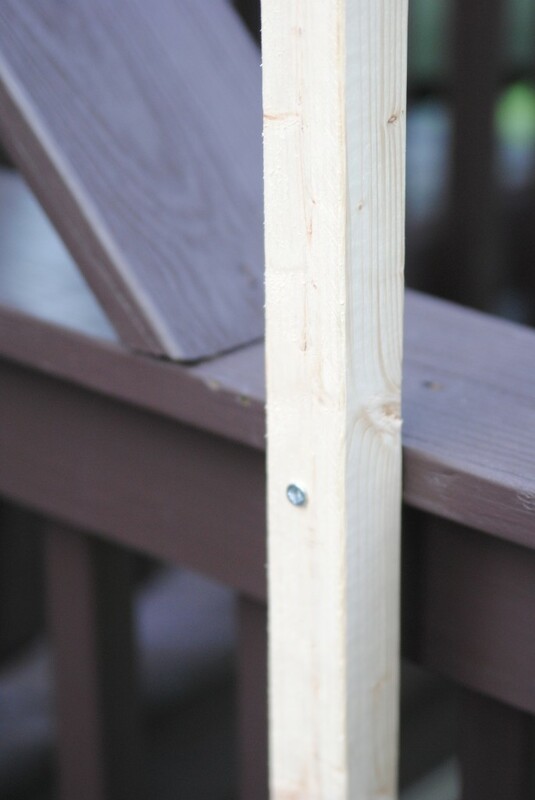 I’ve been thinking about something like this for a while but I don’t have a deck to screw in a post. I was thinking of using something like either a 4×4 or even a pvc pipe cemented into a bucket then placed in large Potter or something like that and fill that partially with rock and dirt. I’m not sure how much torque is going to be subjected to posts however. I’ve even contemplated placing a footing into the ground which I then could secure either a 4×4 or pipe. Like others I concerned by possible weight added with wind. I did the PVC pipe in concrete in buckets and I don’t recommend it. The PVC pipes are too bendy. I recommend something much less flexible. Thanks for letting me know, we have a new deck with composite decking so I’m trying to figure out a new strategy! I used your instructions and made this my weekend project!! It worked out great!! Thank you for this informative blog!! I want to share my photo with you! A. We have our lights up and now that Fall is fast approaching, we are wondering, what’s the best way to store these lights away for the Winter? They are very fragile and we’re afraid they will break in storage. We store ours gently wrapped around cardboard in small, hard-sized plastic storage boxes. They are super fragile as you said, so a layer of bubble wrap around them before they go into the box is a good idea as well! These lights have become my favorite. We’ve never maintained our outdoor lights before, so I think that we’ll just go ahead. Thanks for sharing. We have an aluminum patio cover, so i cant screw anything in to it. I was thinking of using those stick-on-the-wall hangar things and placing them high up on the beams that support the overhang. Thoughts? This is such a great question, we’re about to get composite decking on our new deck and I’m going to have to figure this out! You might try heavy-duty zip ties, pulled tightly, and use several all along the where the pole meets the decking to make sure everything is attached securely. Let me know if that works! Hi! I was wondering if there is a danger with lightning for hanging string lights this way? Mainly, the 2x2s and the cup hook? It’s important to use outdoor rated lights, and check often to make sure there’s no safety issues. We also take them down for the winter season so the lights aren’t overexposed and also to inspect them to make sure they’re still safe. We’ve been fine using this method, but it’s important to follow safety protocol when it comes to anything involving electricity.